The newly opened Tampines 1 gave some bloggers a tour of their more interesting shops and eateries. I'll blog the other shops later. Let's zero in straight on the food first! 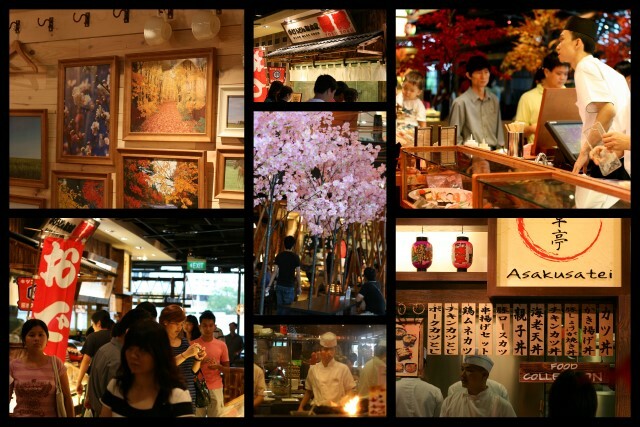 We ate at Manpuku Japanese Gourmet Town, at the third level (as you can see, the whole mall is very crowded). 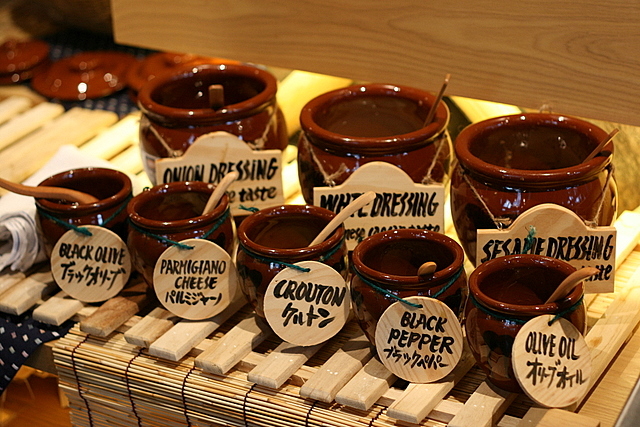 Manpuku is a 500-seater food hall bringing together ten of Japan's established brands. Technically, this concept is fantastic - it lets your tastebuds travel all over Japan, sampling some of the best in each region. They've got the chefs here for a month, training the local staff and imparting recipes that will uphold the brand's image. 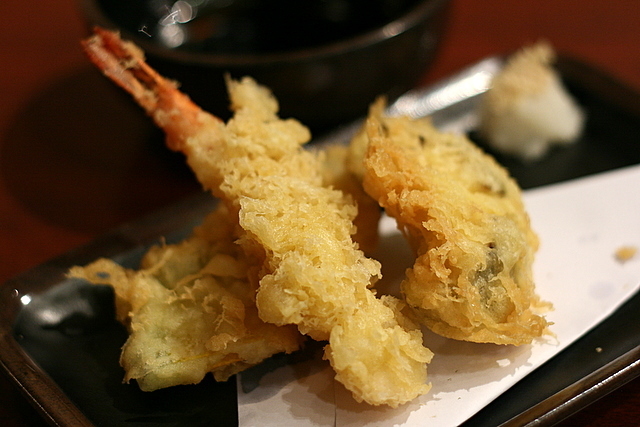 There is already one Japanese Gourmet Town at Vivocity, but that one has only three brands. The name Manpuku means a full stomach or having eaten to satisfaction. Hokkien folk might term it "jiak par par". With so many enticing choices under one roof, it's quite likely you will overeat! They've done a pretty nice job infusing the place with atmosphere reminiscent of Edo street stalls. They have also managed to create pockets of privacy for dining, so it doesn't look like a mass-market open food court. There are country-style booths, bamboo partitions and a narrow gallery decorated with photos and mirrors. One section is even gaily trussed up with plastic sakura blooms. OK, on with the food - we weren't able to try ALL the ten stalls, but here's what we had. 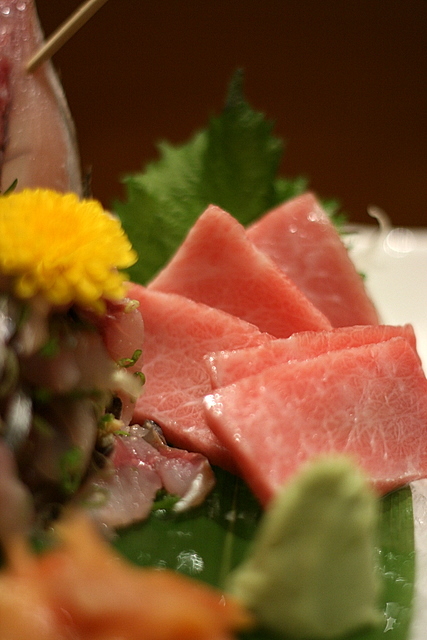 Kai flies in fresh fish three times a week from Tsukiji. 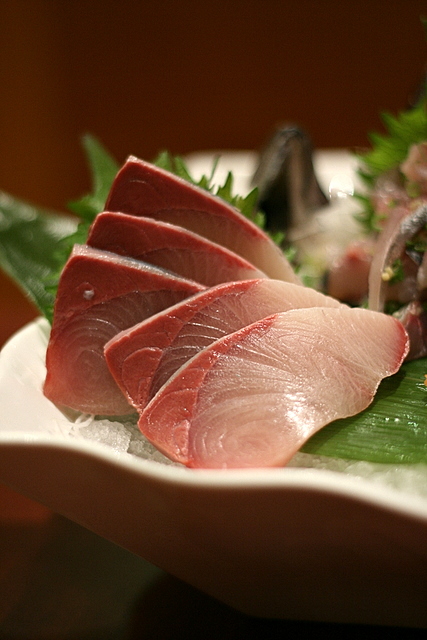 We spotted slightly more unusual stuff like anago, geoduck and Kinki fish. 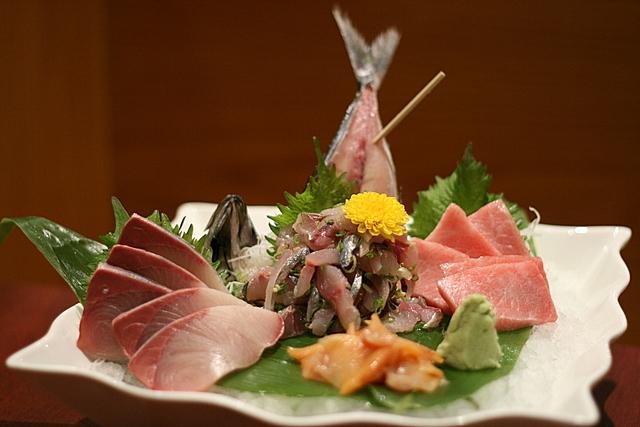 Here's a sashimi platter with whole aji (horse mackarel) tataki. There is no fishy smell, but aji is still not quite my favourite fish. Otoro? I couldn't believe my eyes! Oh, it was firm and buttery, all right. A splash of tart lemon juice helps cut through all the fatty goodness. Mmmh, this was good. It's the first time I've tasted really good scallop sashimi in Singapore - truly sweet and fresh. And the uni was remarkable. None of the putrid metallic taste. Instead, I finally have some inkling of that subtle jasmine bouquet that NinjaHK repeatedly enthused about. The chutoro(?) cubes were slightly too sinewy though. Of course they have crowd favourites like dragon roll sushi. They even have a full refridgerated display case of ready-packed sushi for takeaways, much like what's available in supermarkets. Kushiyaki items from Sesson Japanese Grills. I didn't get to try these, but have heard these are good. They certainly look delicious. Prices are reasonable too. See menu here. I certainly shall be back to try them! The grill stall also has lots of salads for you to choose from, and condiments galore. Unagi kabayaki (S$12.80) from Sesson Japanese Grills - meaty and sweet. The skin was a bit too rubbery but that could have been our luck. I found out later on that they actually charbroil this dish in front of you upon order. The sizzling performance is meant as a feast of sight, sounds and smell, a prelude to the taste you will enjoy. 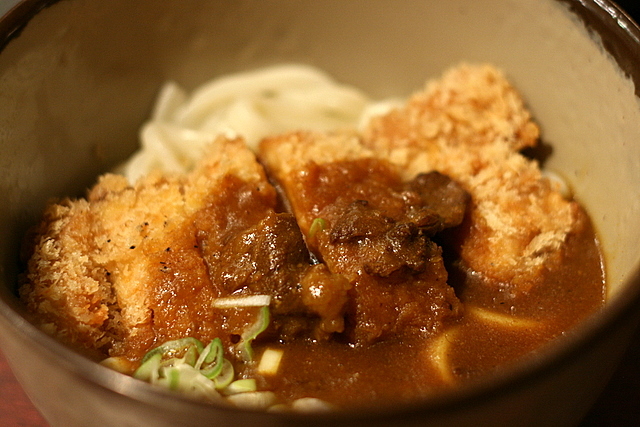 The Toku Toku handmade udon was highly recommended for its texture. You can have it so many ways, as shown above. 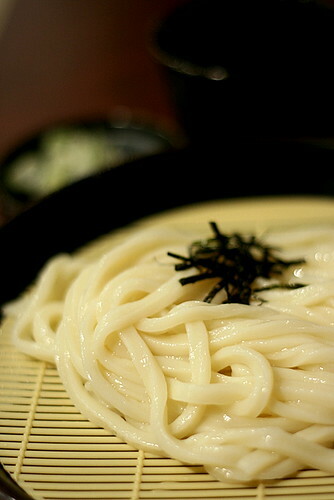 The udon is more springy than most, but alas, it's no Mentsu-dan. For sure, it's not bad for Singapore standards but still a little bit too soft and coarse for my liking. ...Or with aromatic curry roux. Both of which I didn't try, so I'm not sure how good they are. 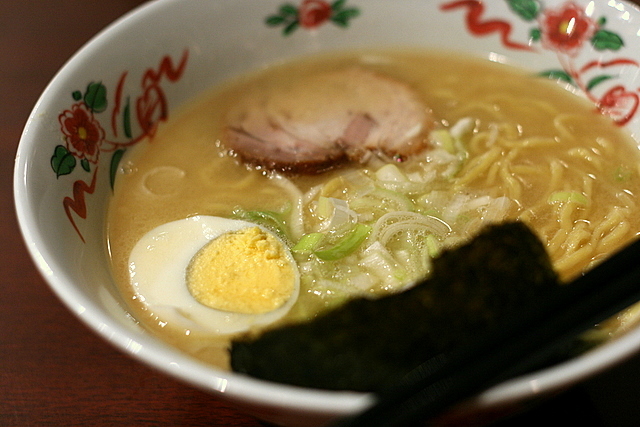 Ramen aficionados will be glad to see yet another entrant to the local ramen scene. Aoba Hokkaido ramen. It's the Asahikawa variety like Santouka and Baikohken. Soup's adequately salty but a little lacking in robustness. The curly noodles also have a mild alkaline hint. 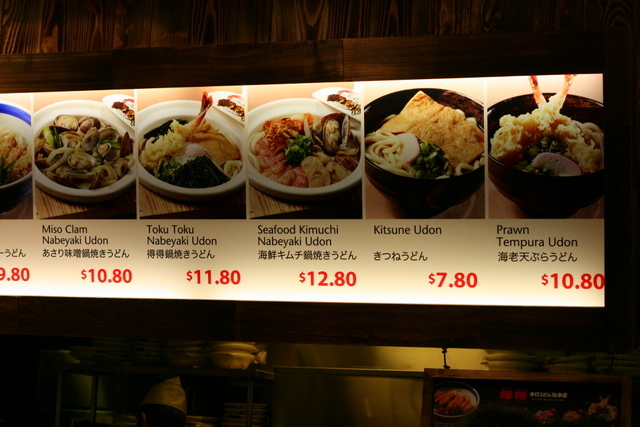 Prices are really reasonable though - starting from S$8.80 (the tontoro ramen is the most expensive at S$14.80). I have a fuzzy menu here. Interestingly, Ajisen is absent here, despite Manpuku being owned by the Ajisen chain. 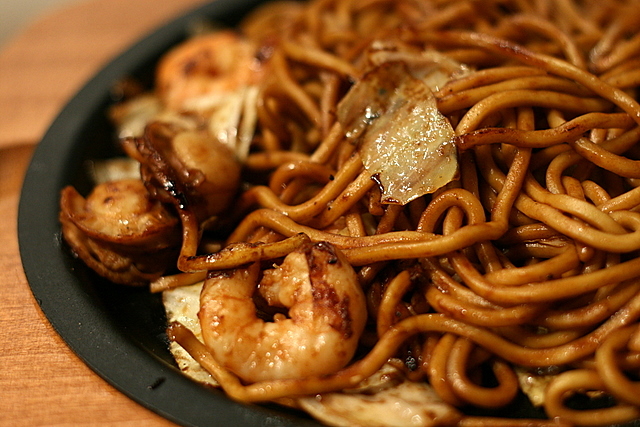 Botejyu's yakisoba with prawns and scallops. I often regard this as Japan's answer to "mee goreng". This was not bad, but I secretly wish someone would come up with a spicy version. I didn't try the Hokkyokusei Omu Rice either. Omu rice has never been a favourite of mine. 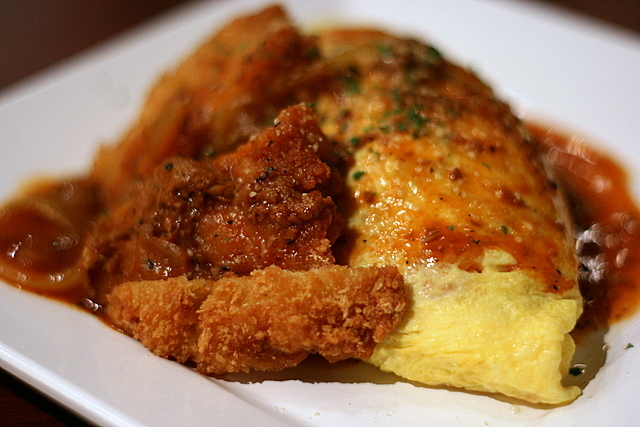 I don't really get the appeal of wrapping rice inside an omelette. Most likely because I haven't tried a really good one. Maybe I should have given this a go. Omu also brings to mind the "ohmu" in Nausicaa of the Valley of the Wind. Look, it's even in the same shape! Sorta. And just for fun, here's an Ohmu bento! Anyway. These are just some of the savoury items - we couldn't cover everything. There's a wildly popular Fruit Tart Paradise. I have photos of six of those gorgeous tarts, which I'll post separately tomorrow. 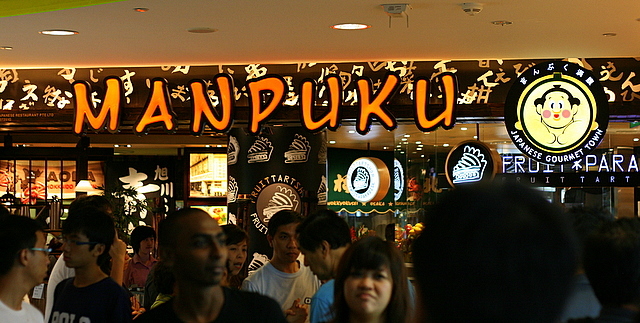 Tampines 1 has its own mall blog - here's one entry on Manpuku itself. HungryCow hasn't posted his review yet, but I'll link to it once it's up. Meanwhile, check out Keropokman and his family's experience. For the full list and description of stalls, check out the Manpuku website below. Big thanks to the cheery A&P folks of Tampines 1 and their agency for the opportunity to check out Manpuku! I still have a couple more posts coming up in the next few days. Stay tuned. 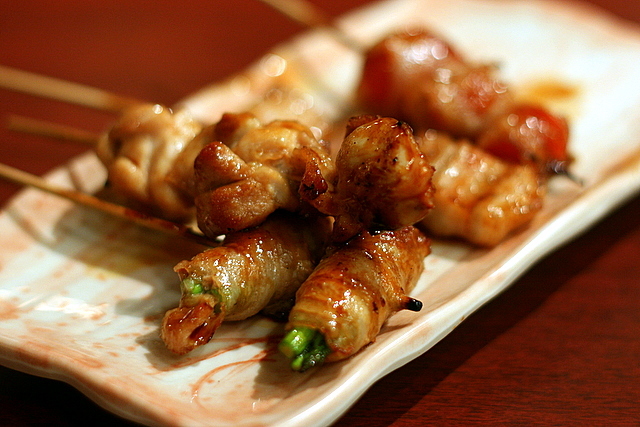 I tried the Kushiyaki items from Sesson Japanese Grills. Pork Asparagus roll and the baby scallop grill. Reasonably priced at $1.60 and $1.80. Baby scallop juicy and tender...just like a baby haha. Pork asparagus roll is worth a try, not VERY special though. 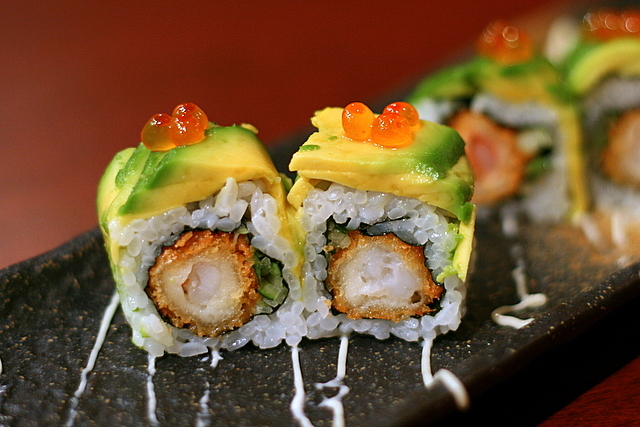 ah the dragon roll sushi probably wont work with me because i dont fancy avocado. heh. your first photos look very good! I think if they include ajisen in, it will "corrode" the whole branding, i dont have a good impression of them. pity i couldn't go for this one, if not it will be fun to meet up with cow and you! Ricky: oh yes, I am eyeing the baby scallops! Only S$1.80, right? LIC: yeah it was a pity you weren't there. I'm sure there'll be other events though! Hi Camemberu, just wondering about the cost of the sashimi... did it cost a bomb? 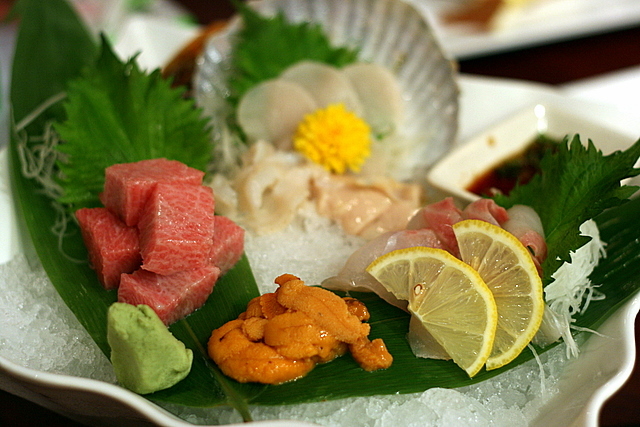 Jane: I didn't buy the sashimi, so I'm not sure of the cost. I did see a S$36 price tag for the otoro at the counter but they didn't state how many slices. Will update next time I go. Lousy food lah... overpriced and overrated. Have you been 'bought' by the restaurant? Visited the restaurant last week with a couple of friends. Our comments are. Overpriced with small portion. Food is so so only. We queue for the fruit pie. Did not notice any price displayed. Came out $7.80 per piece. Felt deceived because no price was displayed (other stalls do have). You will only know the price once they check your card at the exit. Will never visit this place again. Queued for nothing...food is lousy, expensive and very little. Sigh. Thanks for the feedback. I haven't been back since my early April visit, but it sounds like the place has gone a bit bananas since the Japanese chefs left after training the locals for a month. The Aoba Hokkaido ramen shoyu soup base which i ordered was delicious especially the 'melt in ur mouth braised pork slices'. 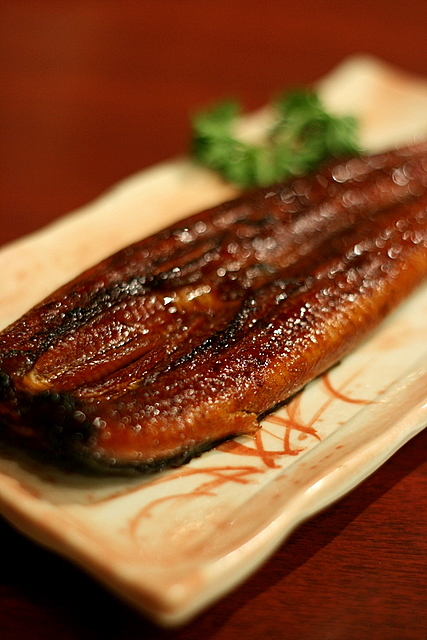 The grilled unagi was a disapointment as i suppose they use china or taiwan eels(jap eels have finer bones n meat). I tried the mont blanc strawberry tart and i thought the custard n cream beneath could do with a lighter consistency. I went there around 2/3 weeks after opening, the picture of the food looks very very very good, but when served, its really like 40% of what the pictures show. I felt cheated and the food wasn't good. Wah I hope the management will see this feedback! food is super lousy, agree with Robin, only 40% of the quality & appearance after ordering! Cooks (from mainland China) were rude. Ordered the Omu rice and Aoba ramen and I didn't even finish my food.